"These meatballs are easy to make and taste fantastic. 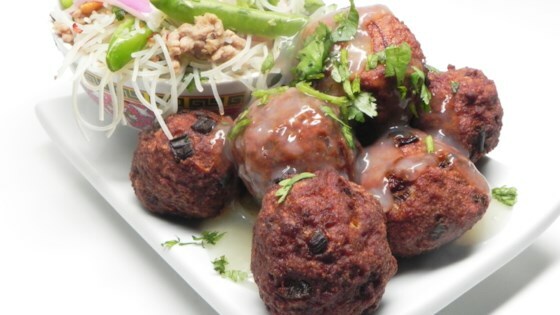 Pork meatballs are deep-fried until golden, then simmered in a seasoned chicken stock. Garnish with cilantro and enjoy with freshly cooked rice." Combine pork, eggs, 1/2 cup plus 1 1/2 tablespoon cornstarch, spring onions, ginger, salt, and soy sauce in a large bowl. Mix well and form into 8 balls. Heat oil in a large wok over medium heat. Cook meatballs in the hot oil until golden brown, 3 to 5 minutes. Transfer to a paper towel-lined plate using a slotted spoon. Drain all but 2 tablespoons oil from the wok. Return meatballs to the wok; add enough chicken broth to just cover meatballs. Bring to a boil. Reduce heat to low; simmer until meatballs are no longer pink in the center, about 15 minutes. Mix remaining 1 tablespoon cornstarch with water in a bowl. Stir into the wok until chicken broth thickens, 3 to 5 minutes. Transfer to a serving dish. Delicious! Only thing different I did was add a little sesame oil. Will definitely make again!